At Conduent, we believe that the promise of blockchain is not just about the technology — it’s about creating new and better ways of conducting business. To that end, we’ve created and adopted a strategy around blockchain that is differentiated and unique, both at a technology platform level and at a functional business level. With a deep understanding of a wide array of our client and industry use cases, we’re building platforms that will help our customers conduct digital interactions at scale and open new lines of revenue through the power of blockchain. 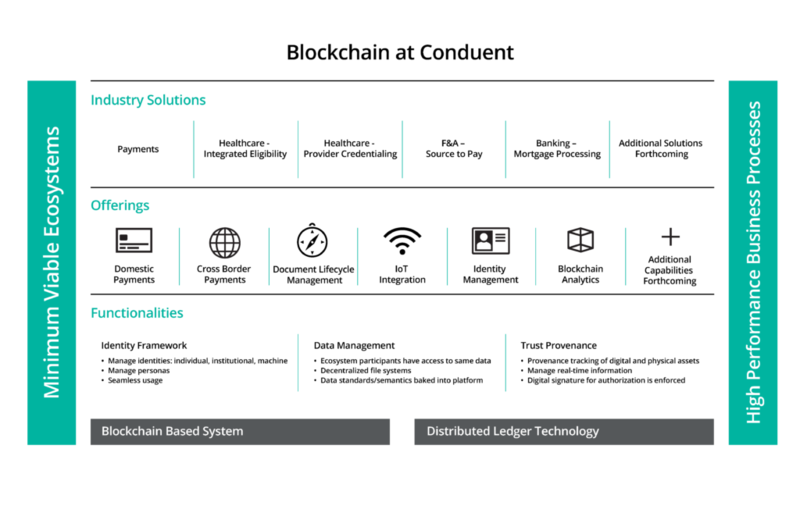 Conduent’s Blockchain platform is an open, modular platform designed to support industry-specific blockchain-based ecosystems. It connects multiple organizations to enable immediate, seamless, secure information sharing backed by a ledger that cannot be altered. Conduent’s identity, data management and payment solutions, which use smart contracts and advanced cryptographic algorithms, have been incorporated to reinforce security. Our platform manages the orchestration of business processes across networks, and thereby across institutions. It leverages our intellectual property in automation, artificial intelligence and process management. Platform features such as asset definition, smart contract definition and contract lifecycle management enable us to rapidly build applications that uniquely leverage the capabilities of distributed ledgers. The platform is also tightly integrated with payments so that the status of the payment transaction is reflected on the chain itself. We are building capabilities on open-source blockchain platforms such as Hyperledger Fabric, deployed on Azure and Google Cloud. Our objective is to enable high-performing, trusted, and scalable business ecosystems. Finance and Accounting – The solution automates supplier negotiations, creating purchase orders, receipting, and invoicing. Smart contracts automatically keep an immutable record of purchase orders and their matching goods receipts and invoices, without the need for manual three-way matches. Payments are automated and can be traced back to individual contracts and purchase orders, without the need for costly reconciliations. We have also built a proof of concept (PoC) with IoT integration. Healthcare Provider Credentialing – Payers today spend an estimated $2B annually to maintain provider data. Thirty to forty percent of this data is usually outdated, incorrect or missing. This solution would bring a consortium of payers and providers together, to create an immutable record of provider credentials. Smart contracts enable secure sharing of credentials across payers and provide a single view of all provider data. Integrated Eligibility for Public Assistance – Public assistance programs such as Medicaid provide subsidized benefits to enrollees. However, there is no single view of all these programs today that can provide optimum support to beneficiaries. As a result, these programs are fraught with duplication, fraud, waste and abuse. Blockchain is best suited in this case to build interoperability among the different programs, break down silos and bring trust and transparency. We are offering this solution leveraging our strategic partnership with Microsoft. Vendor Data Management – We are building a web-based blockchain wallet to digitally anchor the vendor and the buyer with an aim to eliminate any risk of fraudulent vendor data modifications. at Conduent can help your business?